NEW YORK, March 22 /PRNewswire/ — Celine: Through the Eyes of the World, a home edition of the acclaimed feature film, newly expanded for its DVD and Blu-ray Disc release, and Taking Chances World Tour: The Concert, a DVD/CD of live performances from Celine’s record-breaking world tour, will be released on Tuesday, May 4. Lensed during the Canadian superstar’s 2008-2009 Taking Chances World Tour (the second highest-grossing ever for a solo artist), Celine: Through the Eyes of the World opens a window into the real life, both on-stage and off, of the best-selling female recording artist of all time. Director Stephane Laporte and team enjoyed unprecedented access to the decade’s top performer as she played concerts in five continents, 25 countries and 93 cities, selling more than three million tickets during her first major tour in nine years. 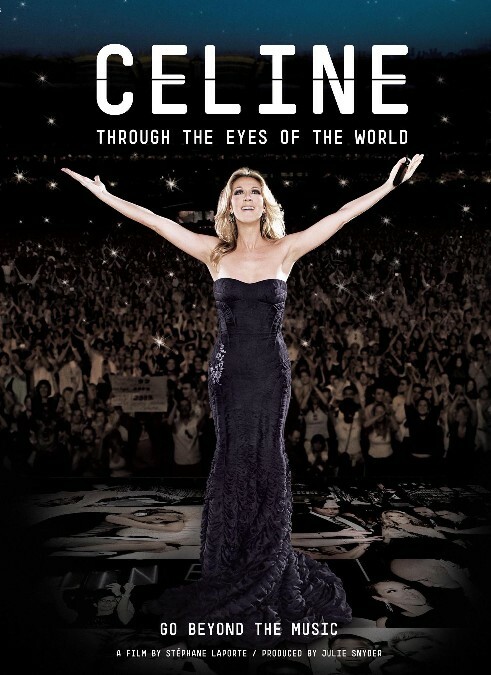 Clocking in at three hours, the home version of Celine: Through the Eyes of the World includes an additional hour’s worth of footage not seen in the film’s limited theatrical run in February 2010. Working with choreographer/director Jamie King, Celine Dion created a multi-media state-of-the-art production for the two-hour concerts on her monumental Taking Chances World Tour, the eleventh of her career. Running from February 2008 through February 2009, featuring both Anglophone and Francophone setlists, Celine’s Taking Chances Tour broke attendance and box office records at venues around the world. Taking Chances World Tour: The Concert, a DVD/CD souvenir combination set chronicling the event, will be available. A special limited edition deluxe two-DVD set — featuring both Celine: Through the Eyes of the World and Taking Chances World Tour: The Concert and a 52 page booklet and fold-out souvenir postcards — will be available direct-to-consumer through Celinedionstore.com. Having sold more than 200 million albums around the world, Celine Dion is one of the most immediately recognized, widely respected and successful performers in pop music history. During her spectacular career Celine has been honored with over 1000 awards. She is a five time Grammy Award winner, including Album of the Year and Best Pop Album for Falling Into You (1996); and Record of the Year and Best Female Pop Vocal Performance for “My Heart Will Go On” (1998). Her recordings have won two Academy Awards®: Best Original Song in 1992 for the title song of Beauty and the Beast (with Peabo Bryson), and Best Original Song in 1998 for “My Heart Will Go On” (From Titanic). She has earned seven American Music Awards, 20 Juno Awards (Canada) and an astonishing 40 Felix Awards (Quebec). In 2004, Celine received the Diamond award at the World Music Awards recognizing her status as the best-selling female artist of all time. In 2007 she was honored with the Legend Award at World Music Awards in recognition of her global success and outstanding contribution to the music industry.